The flu or influenza is a serious illness. It is more than just a runny nose and sore throat. The flu can make you very sick and cause you to go to the hospital or even lead to death. 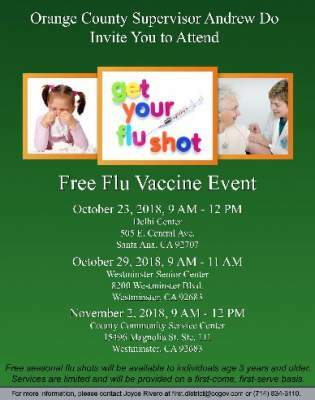 The Centers for Disease Control and Prevention recommends that everyone 6 months and older get the flu vaccine (flu shot). You can protect yourself and those around you by getting a flu shot. Any questions? Please call Chairman Andrew Do’s office at (714) 834-3110.